Kim is doing a wonderful "pay it forward" give-away, and I was picked! (Time for truth in advertising: she picked all of the eleven people who wrote comments, whatta gal!) But here's how it works: She has 365 days to send me and the other ten lucky ducks something handmade, and I will "pay it forward". I can't equal Kim's energy, plus it's my first time at this kind of thing, so I'll only be able to gift three of you. If you would like to receive a handmade gift from me, and are willing to make and send a handmade gift to three of your blog readers, please leave a comment to let me know. Once you decide to be a part of the fun, and if you are picked, you will receive something from me within 365 days. 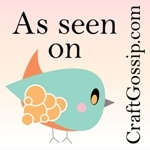 In turn, you will have 365 days to make something handmade and send to your blog readers. The first three commenters (commentators?) will be the winners! 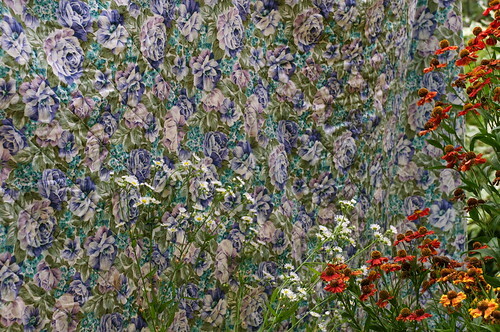 You may also be interested to know about Lila Tueller's giveaway of her not-yet-released fabric line, Eden. A jelly roll and a layer cake. Yummy! 1. I disabled the link between Flickr and Facebook, where FB would show my recent posts to Flickr, so that my FB friends, which include some of my colleagues and students, wouldn't know how much quilting I have been doing. I have had a number of "where do you find the time" comments, which can only truly be answered by "by not doing all the other things that need doing". I think the only point of overlap now is my friend and lab manager, Lindsay, but, as well as being my enabler, she has her own time-sucking addictions. 2. I was so distracted by other things that I forgot to register for Run for the Cure this year. Only, this year, it would have to be Shlep for the Cure, since my knee is still too wonky to do any sustained running. To mitigate this failing somewhat, I donated to the Australian Breast Cancer national fund via Julie at Bush Baby Jag. Julie is also giving away some awesome fabric and other stuff, so virtue may be its own reward or it might get some help. My brain goes to sleep when I'm fasting on Yom Kippur, but I did manage to trim and true all my blocks for the Whirlygig quilt without nipping my fingers off. 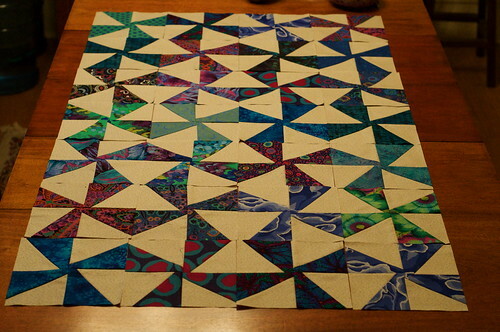 There are 72 blocks at 7 1/2" square, to make up into 56 x 63" quilt top. So it will be twice as wide as the blocks in the photo and a bit longer. I'm trying to decide whether I want a border or not. Last night we broke the fast at the home of some friends. I headed straight for the coffee, and boy did it hit me like a kick from a mule! My headache vanished immediately, and I paid elaborate compliments to the blintzes, kugel and smoked salmon. But I paid the price of that java jolt later by not being able to sleep at all. The battery from my laptop ran out at 3.40am, but not before I had spent a small fortune ordering fabric online. Oy! Southern Skies blocks, originally uploaded by Shadrach Meshach & Abednego. 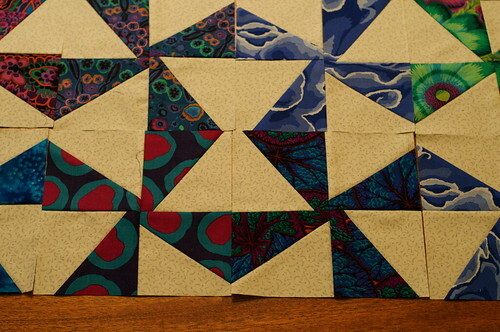 The last day of our Square in a Square workshop saw us making these Southern Skies blocks. As I mentioned in a previous post, I really had no idea what I was going to be making when I prepared the materials for the workshop. I'm not sure I would have chosen this fabric had I known more about the pattern these blocks make up. On the clothesline, it's hard to see the blocks side by side, but it is striking how different the red and blue blocks appear. The Square in a Square method seems like a good choice for making long, skinny points without stretching or otherwise losing shape. Overall, I was pleased with the workshop, although I overbought in massive amounts, due to the poor directions on the materials list. Never mind, I now have enough fabric to make at least lap quilts from both of the patterns from today and yesterday, and I like them well enough to do it. Prairie Claw block, originally uploaded by Shadrach Meshach & Abednego. How to make a million half square triangles with perfect points in a flash. How a stiletto is better than pins. 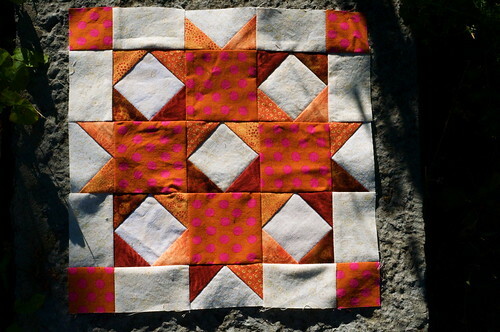 How to construct just about any block starting with a square and adding strips to the sides. It was cool enough for me to buy the book and ruler. Those half square triangles alone are worth it! 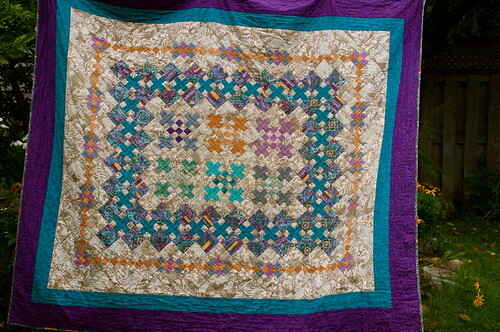 old quilt, originally uploaded by Shadrach Meshach & Abednego. I forgot one! And what a one to forget - it's on my bed right now. I made this one while I was pregnant with my daughter. Pin-basting that [expletive deleted] on the floor at seven months pregnant was a real feat, and quilting it at the machine wasn't much easier! It's from a book by Mary Ellen Hopkins that was all the rage back in the day. 1992-1993. The colours on this have faded over time somewhat, and the binding is fraying. I need to retire it. But I can't do that until I make another one, now can I? nine-patch detail, originally uploaded by Shadrach Meshach & Abednego. 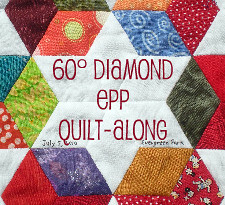 Here's a closer look at the centre of the quilt. I still love the colours. blue roses on the back, originally uploaded by Shadrach Meshach & Abednego. My husband often makes the bed with this side up. It makes me insane, since it isn't a pieced back and the fabric is nothing special, and besides! I worked so hard on the front! 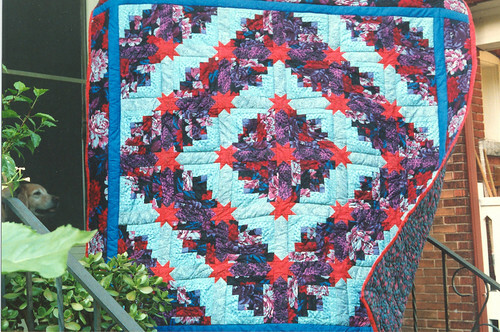 The fabric above is to make a quilt called Southern Skies. The fabric below is for one called Prairie Claw. I was a bit more cautious and restrained in my fabric choices since I don't know what I'm aiming for. If I like it, I can probably add to the range of colours a bit. With any luck, I'll like at least one of these enough to expand it for a wedding present in the spring. Wish me luck! 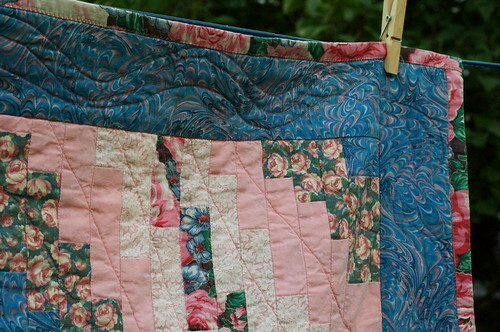 I found photos of three other quilts in our photograph albums. I know of at least two more that I made for friends, but I assume we never took photos of them. 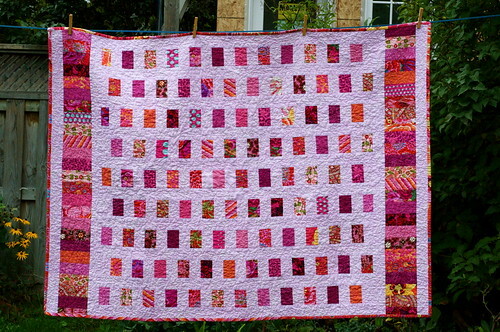 I gave away all the quilts that you see in this post. 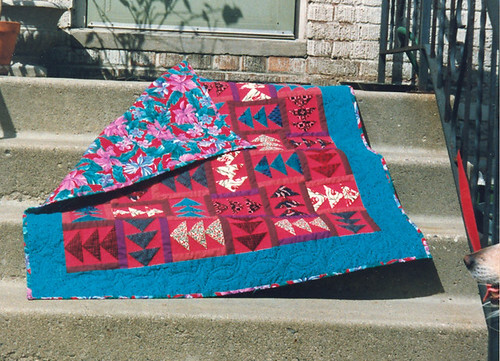 Here's the first quilt I ever made; the back of the photo says 1992. It went to a friend who had just had her first child, a baby girl who's now a senior in high school. I love the red and turquoise today as much as I did then. Despite my strict instructions that the quilt should be used, it went on the wall above the baby's crib. Sigh. Did you catch the dog's nose in the lower right of the photo? You can see her better in the photo below. The red fabric that is used for the background of the flying geese, along with the brick red and dark red of the small sashing between the blocks, was massive sale yardage I bought in 1982, when I was living in Memphis with my then-boyfriend. I had just bought an old quilting frame at a garage sale, and I decided I would make a quilt. 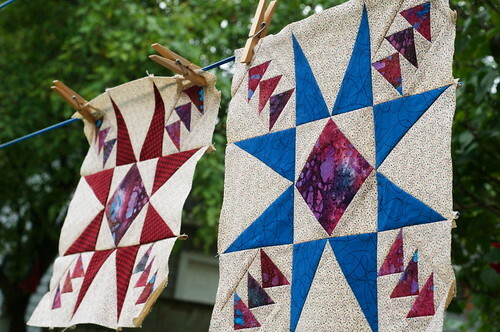 I actually pieced a huge, simple star - imagine a bed-sized nine-patch - and made the quilt sandwich with muslin on the back and an old wool blanket as a batt. I rolled it onto the quilting frame and it sat neatly against the length of my living room the whole time I lived in Memphis. Somehow - lost in the mists of time, but it must have been as oversized baggage - I brought it to Montreal, all rolled up on that quilt frame and wrapped in garbage bags. I put the frame back together and it stayed against my living room wall all through graduate school. Let's skip over the ten years that it stayed on that quilt frame, untouched! I finally removed it and found that the 18 inches that had been exposed on the frame had faded terribly. So I unpicked it and salvaged the fabric in the quilt you see here. I still have some of those reds in my scrap bag! Below you can also see a much younger me, along with my two dogs of blessed memory, one-eyed Jemima and the gorgeous Georgia. The second quilt I made was a wedding gift for friends. The pattern is called Indian Trails. I chose colours and a pattern that I didn't really like, because I did not want to succumb to the temptation to keep it when it was finished. That was a mistake. I learned that one must always love the projects one makes for love. This was the only quilt I have ever made that I didn't look forward to working on. 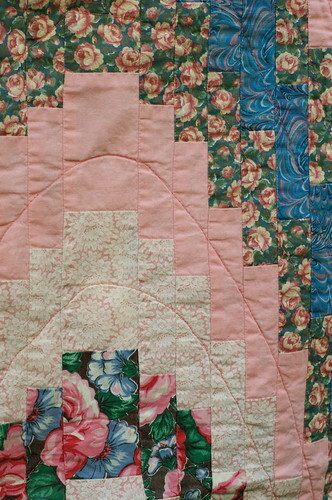 You might notice that half of the points in the blocks are the same brick red from 1982 that I used in the baby quilt. This is also the only quilt I have ever made that has a label of any description (I have a plan to rectify this). My friends loved their wedding present. This quilt also went on the wall, instead of the bed where it should have gone. 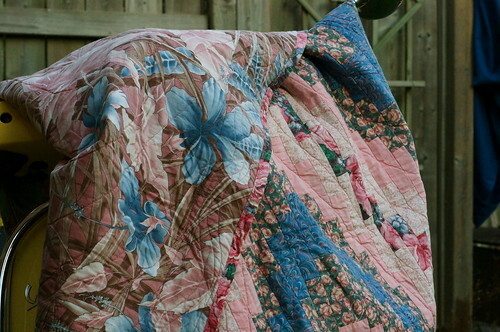 There is a folk saying about sleeping under a new quilt bringing luck. I'm not drawing any conclusions about causality, but the couple are no longer together. 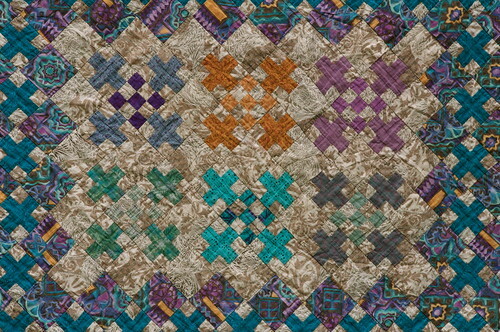 The last quilt I have to show is a variation on the log cabin, made in 1994. It went to a friend who was moving to Israel. 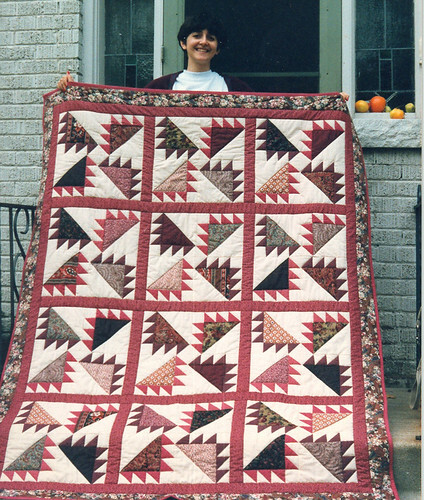 This was the last quilt in which I ever used polyester batting. At the time, it seems like everyone was using it. It does allow wider unquilted spaces, and there is something elegant about the way you can outline the block and have the high loft of the polyester give a nice dimensionality. But in every other way, it's just plain nasty. I wish I had closer photos to show the piecing. As I recall, the quilting on this was pretty awful. 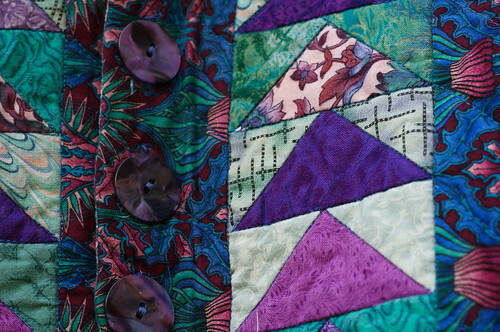 I quilted in the ditch on the light sides and did horrible free-motion quilting on the dark sides of the blocks. I was waging a losing battle with my horrible old bargain-basement Singer. Clearly, I was asking it to do a job far beyond its ability and inclination. 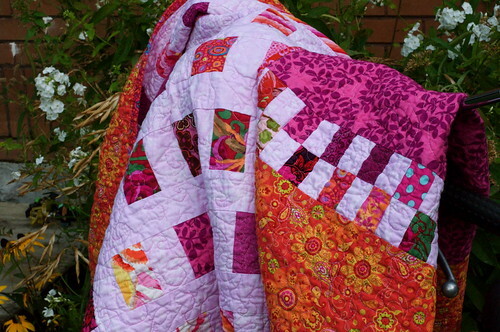 When I remember how hard it was to machine quilt those projects, I can't believe I am smiling in the photos. Maybe it's just from relief! That's the end of the journey through the past. It's onwards and upwards from here, folks! P.S. Wishing lots of luck to my pal, Lindsay, who is taking her first ever quilting class tonight! When I was working on my PhD, I took an evening course in quilting offered by the local school board, for something to do as a relaxing change of pace from all the academic work. 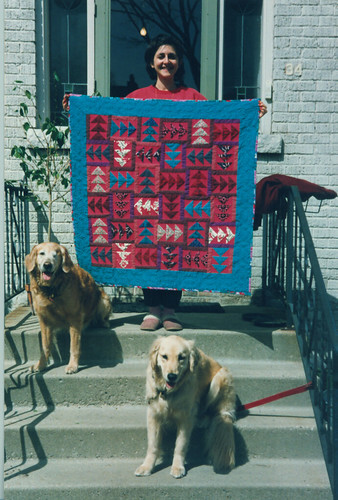 I remember the teacher was a wonderfully skilled, older lady with many examples of quilts and quilted crafts. 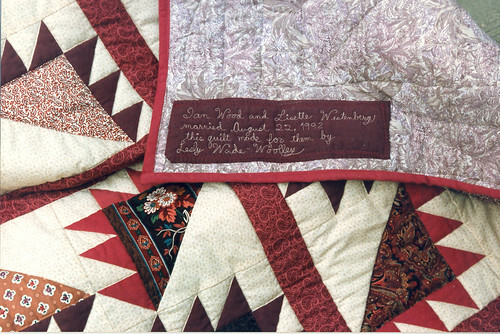 On the first night, she gave us each a little block that she had prepared, with a preprinted mini-panel front, all nicely basted with Mountain Mist polyester batting inside and muslin on the back, and she asked us to use our best stitches to hand quilt along the preprinted lines. She wanted to see what skills we brought to the class. I remember being quite anxious as she inspected mine, and she told me I should strive for smaller stitches that wouldn't catch, although she did say that they were nice and even. I still have that little square somewhere. I used it for a needle holder for years and years. I actually went looking for it to take a photo for the blog, but I couldn't find it. I did, however, find some of the other things I was looking for. This is a little lap quilt I made for my grandmother. It's a bargello pattern that is much easier than it looks. 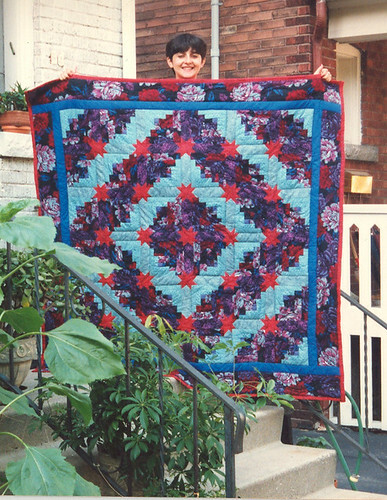 I did a one-day workshop at my LQS in Toronto at the time - and have very clear memories of hours and hours of rotary cutting and strip piecing like a demon, trying to get it all pieced by the end of the day, because the top was pinned to the design wall and couldn't easily be reconstructed at home. On a student budget, I got all my backing fabric from the sale bin. I was lucky to find one that fit so well. Although it has faded a bit from use, the colours are brighter than they seem in the photos. 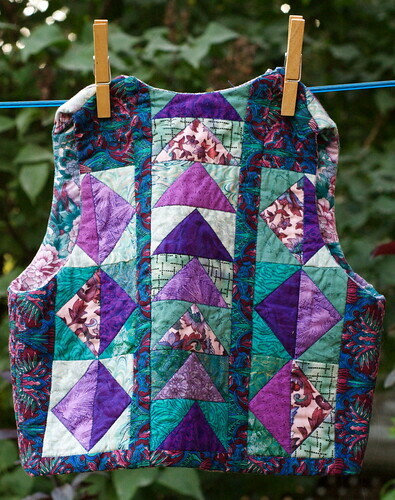 And here is a little vest that I made for my daughter when she was about two and a half. I'm pretty sure this is the last thing I made before my loooong hiatus from quilting. I got a random vest pattern from the fabric store, Simplicity or some such. I cut out the pattern pieces and eyeballed how big a pieced section I would need for the back and two front pieces in order to fit the pattern on. I love the purples, greens and blues, and isn't it funny that those are the colours my daughter chose for her pinwheel quilt that I'm making now? 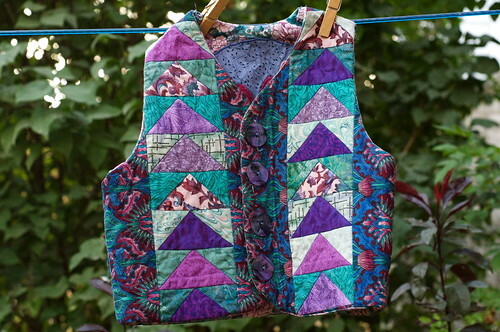 I came across the vest this summer when my husband and I devoted a week to cleaning out the basement. Among other things, I tackled all the boxes of baby clothes, toys, baby bedding, etc. For a while over the years, we thought we might use all that again, but the need never arose. It was hard to say goodbye to the tiny shoes and sweaters! I allowed myself to keep what would fill one large Rubbermaid tub. 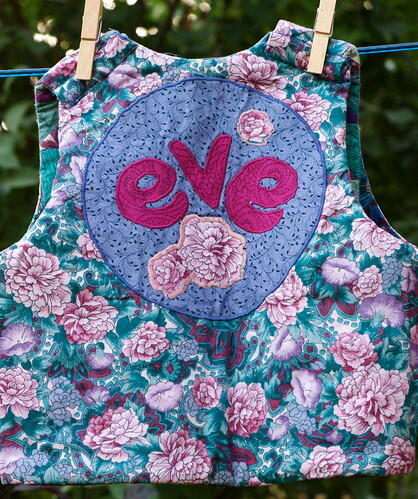 I joked with my daughter that she could use this vest for her children, as long as she named them Maeve or Steve, since I could easily applique the extra letters on. Here's the inside of this reversible vest. My daughter is sixteen and has requested a quilt. 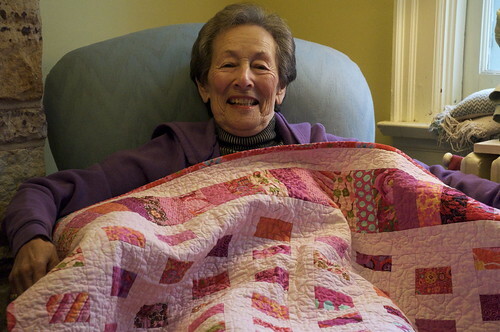 I asked her what kind of quilt she wanted, because it had to be something that I could stand working on, natch! She didn't want anything that had too much going on in terms of pattern, perhaps she's still in the ugh, don't let my carrots touch my brisket phase of life. She looked at several quilts online and rejected many of my suggestions as too busy. But pinwheels were simple and clean enough to suit her. I'm using another roll of Kaffe Fasset from my LQS and other assorted blues, purples and greens. The background is an off-white figured with a pale blue motif. Here are some of the fabrics. The blocks are 7 1/2" when finished. I'm planning on using 72 blocks, which will make it a good size. I really like how this pinwheel tutorial showed the template taped to the bottom of the ruler. I hate using templates, because they are often so small and fiddly, especially homemade ones, and I'm afraid I'm going to rotary cut my fingers off. But this one was perfect; just lay the ruler over the rectangle with the template lined up on the corners and slash away! Easy peasy lemon squeezy! Today after synagogue I got into my comfy drawers and pieced half the blocks. Since the fabric was folded before I cut it, selvedge to selvedge, like normal, it means half the pinwheels will spin one way and the remaining half will spin the other way (we'll say they're from Australia). The daughter wasn't too pleased with that idea, and reminded me she gets motion sickness. Sheesh! 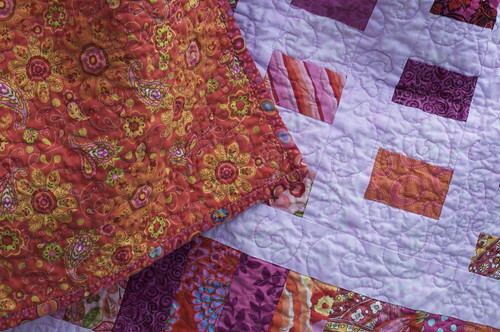 There's no better way to inaugurate a quilting blog than by introducing a new quilt! Here's the one I just finished. I was inspired to do this one by the coin quilt-along on Flickr, plus the rolls of 6" strips of Kaffe Fasset fabric sold by my LQS. I augmented with additional pinks from my stash. 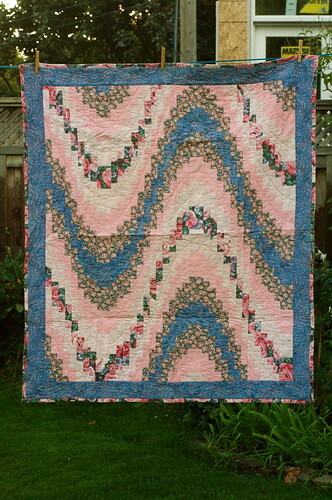 The quilt is machine quilted with King Tut thread, variegated in pinks. It's the first time I've done any free-motion quilting with my new (to me) Pfaff. I'm more or less pleased, although there are some wonky bits. As usual, my corners are a disaster (no photos of those). I've discovered that if I set my laptop on my notions box, I can see the screen perfectly over the top of my machine. So I have been a steady customer at the local independent video store while finishing this quilt. I find that old movies are best, especially musicals! One of my rentals was Valley of the Dolls, which I had never seen. Quite a racy movie in its day, although it seems quite tame today. 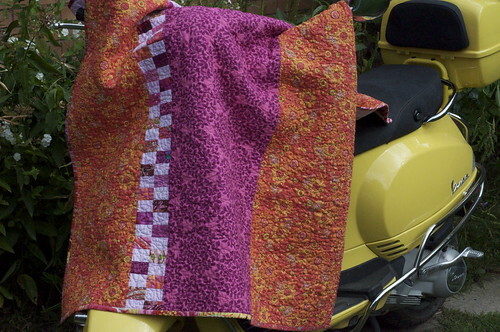 The DVD box and the opening credit sequence was full of bright pinks and oranges, very similar to the fabric I was working with. 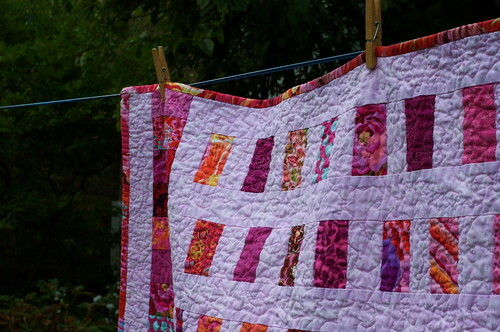 And so it seemed like the perfect name for this quilt: Valley of the Dolls. I wasn't sure about this quilt initially, and I made seat-of-the-pants decisions as I went. For example, the original KF strips were 6" wide, so I planned 6 x 2 1/2" coins and 2 1/2" sashing. I sewed all the dark and light pairs and then decided that the coins were too much longer than they were wide. Does that make sense? They were more like lozenges than the effect I wanted. The strips at the top and bottom were the original size of the coins, so you can see what I mean. So I lopped off an inch and a half from all the pairs and was much happier with the size. I have real problems throwing out scraps, so I kept those lopped-off nubbins. When I was ready to do some kind of pieced detail for the backing, there they were! So as I got further into it, it began to grow on me. And now I think it's so glam and so fab, I hate to part with it. If I have to pick a fault, it's a touch too small. At 48" x 60", it's more of a lap quilt than a nap quilt. Plus, I wasn't as careful as I could be about block placement - there are coins with identical fabrics too close to others in places. And the mitred corners of the binding. Oy. Those are my downfall. And there's a small spot in the middle of the quilt that seems not to have gotten quilted. How did that happen? But on the other hand, it's quilted with bamboo batting and has a delicious drape. It's for my mother-in-law, a lovely with-it woman who loves colour as much as I do. P.S. For those who observe, Shana Tova!